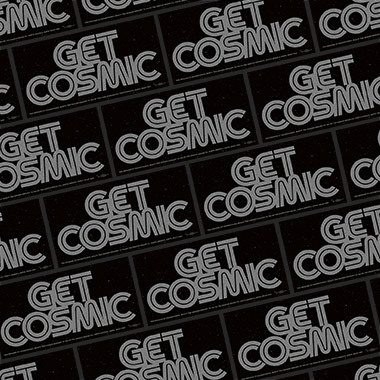 Draplin Design Co.: DDC-126 "Get Cosmic Decals"
Stick these everywhere. From cargo boxes to car windows to telescope instrument chassis. Works everywhere on earth. The cosmos is another story. Will test when we get there. 01. Proudly made in the U.S.A.
02. “Dark Matter” Black on “Cosmic Shimmering Silver” mirror substrate. 03. Thick inks on durable materials. 04. 6” wide and 3” tall. 05. Printed by Andy at Diesel Fuel Prints. 06. We’ll have these in stock until our earthly demise, and/or planet relocation. 07. We’re a speck within a speck within a speck. Within one skrillion, schmillion, billion, kajillion specks. 08. Dedicated to Carl Sagan. ©2015 DDC Dry Goods Div., Merch Dept., Portland, Ore.